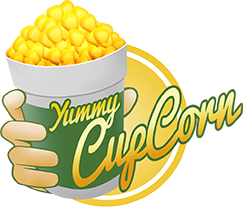 Yummy Cup Corn is high quality fresh sweet whole kernel corn. Very rich in nutrition and natural taste in a cup! The plantations are based in a pollution free area far from the city and our supplier has a unique technique of extracting the whole kernel from the cob to ensure that the taste remains fresh, crunchy and juicy. Nothing has been added or taken away. Yummy Cupcorn is non-baked, non-fried. Contains NO preservatives, ZERO cholesterol, high fiber and a GOOD source of energy. Yummy Cup Corn is 100% Natural! Yummy Cup Corn is high quality fresh sweet whole kernel corn, very rich in nutrition and natural taste in a cup! The plantations are based in a pollution free area far from the city and our supplier has a unique technique of extracting the whole kernel from the cob to ensure that the taste remains fresh, crunchy and juicy.